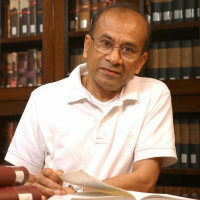 Professor Anton Cooray graduated from University of Colombo (1972), passed the Bar examination at the Sri Lanka Law College with First Class Honours (1974) and enrolled as an attorney at law (1975). He was awarded a PhD by University of London in 1979 and a second PhD by University of Colombo in 1989 for his work on constitutional law. Before joining City University of Hong Kong in 1990, he was Dean of Law, University of Colombo, Sri Lanka. He was Professor of Law and Associate Dean of Law at City University of Hong Kong before he joined City, University of London in 2013. He has held visiting appointments in the USA and France. He was a Commonwealth Scholar in the UK (1975-1979), Commonwealth Academic Fellow in the UK (1986-1987) and British Council Academic Visitor (1991). He was awarded two UK-HK Joint Research Grants to study town planning law and administrative law jointly with academics and practitioners from the UK. He was the Chairman of the Hong Kong Town Planning Appeal Board and Deputy Chairman of the Hong Kong Town Planning Board panel of members. He was a World Bank consultant on legal and judicial reform in Sri Lanka and has conducted a series of training programmes for the judges, State Counsel and academics from Sri Lanka. He conducts training programmes for the Attorney-General's Department of Hong Kong. His research interests are in constitutional law, planning law and comparative law. Cooray, A. (2018). Environmental Law in Hong Kong. USA: Kluwer Law International. ISBN 978-90-411-9470-1. Cooray, A. (2017). Constitutional Law in Hong Kong. USA: Kluwer Law International. ISBN 978-90-411-8740-6. Cooray, A. (2015). Environmental Law in Hong Kong. Kluwer International. ISBN 978-90-411-5885-7. Cooray, A. (2015). Town Planning: Halsbury's Laws of Hong Kong. Hong Kong: LexisNexis. ISBN 978-988-8301-11-9. Cooray, M.J.A. (2014). Trustee Ordinance Commentary and Annotations. ISBN 978-962-661-710-6. Cooray, A. (Ed. ), (2014). Personal Property: Halsbury's Laws of Hong Kong. Hong Kong: LexisNexis. ISBN 978-988-8232-98-7. Cooray, A. (2013). Environment: Halsbury's Laws of Hong Kong. Hong Kong: LexisNexis. ISBN 978-988-8231-19-5. Cooray, A. (2010). Constitutional law: Halsbury's Laws of Hong Kong. Hong Kong: LexisNexis. ISBN 978-988-8054-10-7. Cooray, A. (2016). Environmental Offences. In Bokhary, K. (Ed. ), Archbold Hong Kong 2017 (pp. 2211–2239). Hong Kong: Sweet and Maxwell. ISBN 978-962-661-905-6. Cooray, A. (2015). The reception of Islamic law in Sri Lanka and its interplay with western legal traditions. Mixed Legal Systems, East and West (pp. 213–224). ISBN 978-1-4724-3106-6. Cooray, A. (2014). Entering the political thicket: The role of the judiciary as an arbiter in relation to making and implementation of public policy. The Culture of Judicial Independence: Rule of Law and World Peace (pp. 200–216). ISBN 978-90-04-25780-1. Cooray, A. (2014). Environmental Torts. In Bokhary, K. (Ed. ), Tort Law and Practice in Hong Kong (pp. 677–702). Hong Kong: Sweet and Maxwell. ISBN 978-962-661-632-1. Cooray, A. (2012). Standards of judicial behaviour and the impact of codes of conduct. The Culture of Judicial Independence: Conceptual Foundations and Practical Challenges (pp. 349–358). ISBN 978-90-04-18833-4. Cooray, A. (2012). Environmental litigation in hong kong: The role of the judiciary and statutory tribunals. Law and Development: Facing Complexity in the 21st Century: Essays in Honour of Peter Slinn (pp. 226–245). ISBN 978-1-84314-518-9. Cooray, A. (2011). Standards of judicial behaviour and the impact of codes of conduct. The Culture of Judicial Independence: Conceptual Foundations and Practical Challenges (pp. 349–358). ISBN 978-90-04-18833-4. Cooray, A. (2010). Oriental and Occidental Laws in Harmony: The Case of Trusts in Sri Lanka. Mixed Legal Systems at New Frontiers (pp. 241–264). London: Wildy, Simmonds and Hill Publishing. ISBN 978-0-85490-070-1. Cooray, A. (2014). Hong Kong's Court of Final Appeal: The Development of the Law in China's Hong Kong. ASIA PACIFIC LAW REVIEW, 22(1), pp. 157–159. Cooray, A. (2012). Access to Non-Judicial Justice through Islamic Courts in Sri Lanka: Palm Tree Justice or Accessible Justice? Asia Pacific Law Review, 20(1), pp. 113–133. Cooray, A. (2011). Comparative Law in a Small State: The Mixing of Indigenous Laws in Sri Lanka. Interdisciplinary Studies of Comparative and Private International Law, II, pp. 211–224. Cooray, A. (2009). Some Reflections on the Legislative Context of the Hong Kong Ombudsman. Asia Pacific Law Review, 17(1), pp. 53–72. doi:10.1080/10192557.2009.11788192 . Cooray, A. (2008). Oriental and Occidental Laws in Harmony: The Case of Trusts in Sri Lanka. Journal of Comparative Law, 3(1), pp. 133–150. Journal of International and Comparative Law, Sweet and Maxwell Hong Kong, Joint Editor, 2013 – present. International Journal of Law and Management (Emerald), Member of Editorial Advisory Board, 2012 – present.